An Omen EP_ is a release by How To Destroy Angels_, the band's second release and second EP, and their first release under a label, Columbia Records. The EP was announced by Trent Reznor on 21st September 2012, and was released November 13th. The EP was released in digital and vinyl formats, and contains tracks off of the yet-unnamed debut album from the band. The band's website was updated to include promo photos, more glitch art and a raw graphic style from Rob Sheridan, similar to his previous work with Nine Inch Nails. The first single for the EP, "Keep It Together", was debuted on Zane Lowe's BBC Radio One show on October 8th 2012, and the track was released via digital download on October 9th. The full EP was released for streaming at The Hype Machine and Soundcloud on 8th November. A limited number of copies of the physical release were for sale on HTDA's official webstore, and all copies bought through the site came packaged with a exclusive white label pressing of the EP's lead single, Keep It Together, on 12" vinyl. The lead single for the EP was given two music videos, the first a straight "teaser" video, of the song playing in full on a studio console, the second being a performance video of the song at the Reznors' home studio. Both videos were directed by How To Destroy Angels. "Ice Age" did not get a single release, but was still given a full music video (similar to how "A Drowning" was the single from the band's first EP, but "The Space In Between" got the music video). The video reflects the artwork of the band in terms of distortion and CRT monitor effects, and was directed by John Hillcoat. All versions were released on November 13th. The EP was released in MP3 formats across all MP3 retailers, but the only way to obtain the high quality and lossless audio formats for the release is to order through HTDA's own webstore. The EP was released on 12", 180 gram vinyl and will be the only way to obtain the album on a physical medium, as a CD copy of the EP is not to be printed. When ordered through the band's website, the EP came with an exclusive white label pressing of Keep It Together. The art of the EP was conceived by the entire HTDA group, and was primarily executed by Rob Sheridan. He used a technique of creating art, placing the image onto VHS tapes and then photographing distortion through a CRT monitor. Photography for the EP "An omen", by How to destroy angels. 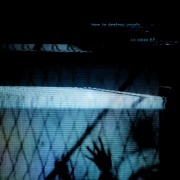 Previous release - "How To Destroy Angels" Sigil number: 3 Next release - "N/A"